I fell in love with THIS card as soon as I saw it. Love everything about it. And I've been wanting to play with THIS adorable stamp for AGES. Here was the perfect excuse. 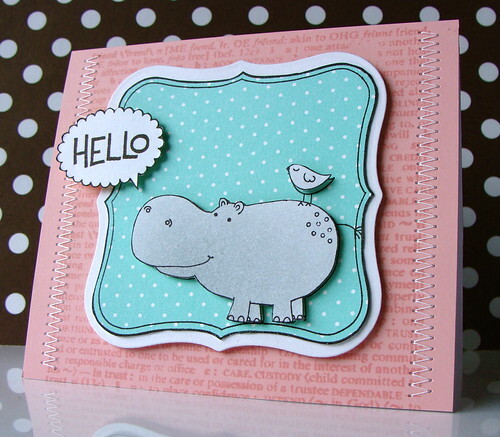 Lisa uses the sweetest stamps on her cards - and LOTS of critter images. Supplies: Stamps - Hero Arts and PTI; Notecard - Hero Arts; PP - PTI. Aw he's lovely! Beautiful card as always. This card is adorable Lucy! Love that little guy and love the pink and aqua color combo! Super cute Lucy. Love Lisa's cards as well. hehe! this make me smile! very cute card, Lucy! Lucy this is so adorable, I love hippos and they always get such a bad reputation, but they are one of my most favourite animals, and this card you made is just so sweet, I love everything about it. Really a joyful card to look at, super sweet colors! This card is precious. I love the hippo. Love your take on Lisa's style! 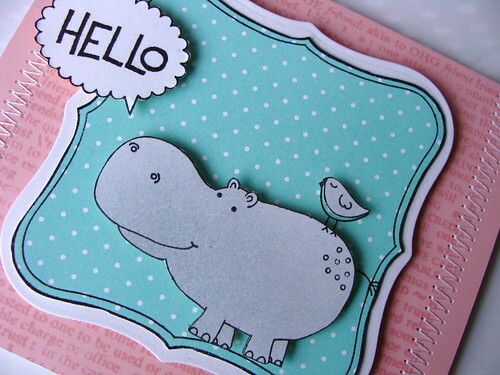 That hippo is just the cutest! Cute card! I love those two buddies! ;-) Your challenge is not too hard! It's the time that is! I have some ideas in my head, just waiting to get out of there!!! Oh Lucy, this is so cute!!!! Love it and the colors are great together! I am honored to inspire you, because YOU inspire me! HUGS! This is super duper adorable, Lucy!! Love the stitching, you totally ROCK!! Sweet!!! the colors are perfect!! hermosa, me encanta!! aww I want to use this for a baby book I need to make...very cute!